Creating complex gradient nodes is a tedious and time-consuming process. With the Gradient Node Builder this chore is sped up easily. Define all general settings in the Gradient Node Builder panel and specify the remaining properties in a spreadsheet or text file. 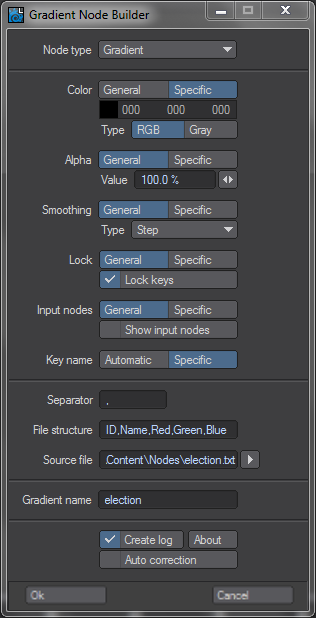 Your desired node is built according to the panel settings and file content. To use it, open the Node Editor and import your freshly-built node. In combination with instancing, you can quickly visualize statistical data or decorate a starship's cockpit while still having each important aspect under control. The number of columns that need to be specified within the file is kept as low as possible. There is no need to include columns for generally defined properties. The plugin has an auto-correction mode that can fix minor errors during the node creation process. The plugin comes complete with an English PDF-based manual. It features a comprehensive logger to help you find errors that occurred during the node creation process. a compiled LScript only available for registered versions (Win & Mac) of NewTek's LightWave Layout. protected via a serial number that is tied to the Dongle ID of your LightWave version. licensed under this License Agreement (HTML, PDF). Registered version of NewTek's LightWave 9.0 or higher. The "Get your license" price tag features the net price - excluding VAT - in € or $US. Both, currency and gross price (including VAT) will be determined on basis of your address during the purchase process. The final buyer price will be shown before checkout. Support is only available in English via e-mail. A 15 minute tutorial using the Gradient Node Builder is now online.